Remember that post I wrote recently? The one where I took some time out to really reflect about where we’re heading in our home ed and as a result changed quite a few things in our home ed? Well one of the realisations I came to is that whilst academics are important, my ultimate goal is that through this home ed journey I try to raise mumins who love their Lord and have exemplary characters. So, as part of our weekly home ed I’ve devoted a part of a day to focus on a characteristic. I don’t want this to simply be me telling them how to behave. Rather I want them to really understand why that particular characteristic is important and for it to become habitual for them. This week we focused on speaking nicely to one another. One aspect of home ed I find difficult is sibling rivalry. And a lot of the arguments in our home start because someone isn’t speaking nicely. Aside from that I believe that we as Muslims should be conscious of how we speak. I sat with the children and we spoke about how it feels when someone doesn’t speak nicely to us. I then asked them to role play an example of speaking badly and what that leads to. They went away and came back and did the role play for me. We then discussed how it feels to be spoken to nicely. Again they went away and prepared a role play for me. It was a really good one and I was surprised at the different ways that showed this positive character trait. 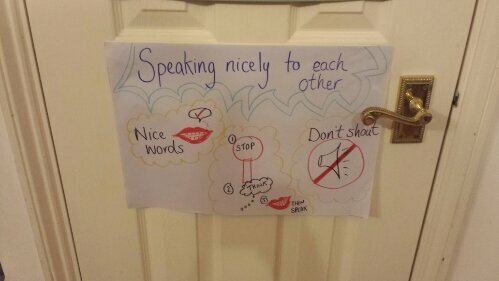 After that we took a piece of paper and decided to make a poster to remind us to speak nicely. I let them lead in this and this is what they came up with. ..
To make it fun we decided to create a family challenge. Whenever someone speaks nicely they get a tick. Person with most ticks gets a prize at the end of that week. The reason behind this is to get them into the habit of speaking nicely. Yes, they might be doing it for the incentive but my hope is that by doing it regularly and me praising them for it, that they will want to do it more often and it will become a part of their nature. I also told them that sometimes ummi doesn’t speak nicely and so they need to remind me too. I can’t tell you how many times they’ve said ‘Erm ummi…’ (pointing to the poster). But I’m glad as it’s making me look at myself too. If I want certain characteristics in my children I must have them too! P.s. 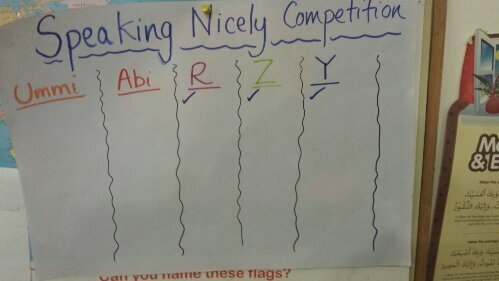 At this time of writing z who is normally the first one to shout and say mean words is winning masha’Allah! !